Despite our best efforts at avoiding baby-fever, with about 5 weeks left before our due date, we’re having to face the reality that this baby will be born whether we’re 100% prepared or not. Because we are who we are, Ian and I hate to approach anything unprepared, so the next few weeks are looking a little busy. That’s okay, actually, because it means we haven’t spent the last 6 months obsessing about every last detail of my pregnancy and our impending parenthood, and as a result feel pretty relaxed about it all. People have been becoming parents forever, long before the plague of how-to parenting books and baby products tsunamied over our society. We’ll do fine. All that said, it’s apparent we will need to put the boy somewhere when he gets home — I need my sock drawer for socks — so here’s what we’ve got. This is the wall opposite the crib. The only major furniture addition would be a rocking chair (Mom and Dad’s) in the last corner. 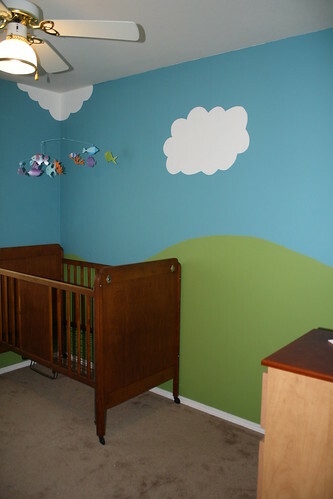 Special thanks to Gary and Deborah, whose crib this is; to Michele and his wife for the dressers; to Melinda for the mobile; and to my mom, for coming and painting in the clouds. And, tangentially related, an obligatory picture, post-processed in the latest popular style. In other progress-related news, we’re looking at refinancing our house already, although we just signed our mortgage two years ago. The mortgage process was agonizing and horrible and far too recent to have faded in my memory, but we’re looking at going from 5.25% to between 3.75% and 3.5%. That’s too tempting to pass up, with monthly payments that’d free up a good bit of cash (once we break even after paying off the old mortgage’s moderately draconian early-termination fees). This means that in addition to juggling working, social commitments, and baby preparations, we’re going to spend the next few weeks struggling with some of the more complicated financial activity a normal household can engage in. This is good news for the weeds in my garden and the nastiness in my toilets, which get a good long reprieve to establish unbreachable redoubts. Oh, yes, the next month is looking like a lot of fun. You yourselves are all the endorsement we need. Your very lives are a letter that anyone can read by just looking at you. Christ himself wrote it—not with ink, but with God’s living Spirit; not chiseled into stone, but carved into human lives—and we publish it. Our son is due in a month and a half — that’s right, August 14, a mere 50 days from today — but because I continue to wear the same clothes, I keep having weird disparities between my mental image of my body shape and reality. I keep underestimating how much space I’ll need to squeeze between things, for example, so instead of just slipping through that crack, I find myself awkwardly caught and looking ridiculous. At this point I never forget I’m pregnant, but my mental image hasn’t quite caught up with this yet. But of course you’d really be missing the point. All praise to the God and Father of our Master, Jesus the Messiah! Father of all mercy! God of all healing counsel! We didn’t really rush to leave super early in the morning, because it wasn’t that long of a ride and we started fairly close to home. Actually, a little more rushing would probably have worked out a bit better, since we ended up arriving just in time for the 9:30 ferry. 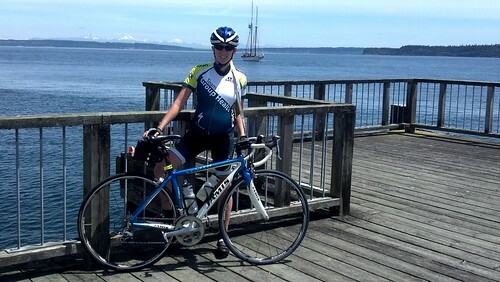 Our original plan called for parking in Edmonds and walking our bikes on the ferry, a much cheaper proposition than driving on. But we arrived in time to purchase our car passage onto the ferry and then drive on, one of the last two or three cars on board. If we’d parked, we would have had to wait for the 10:40 ferry. It worked. On this trip, I tried out my phone’s camera, and it’s okay. Not great, and I learned that I should never zoom in. Zoom is pure digital, and as it gets “bigger” the image just degrades. I can crop for size after the fact if I want less in the image. Without further ado, here’s what we saw. Once off the ferry, we parked (another hassle of having the car) and got rolling fairly quickly. It was a gorgeous day, sunny, warm, and only very lightly breezy, hardly any wind for being on the water. 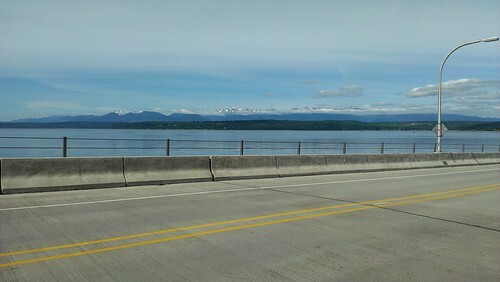 Part of our route took us across the Hood Canal Bridge, which had a nice wide shoulder suitable for biking. 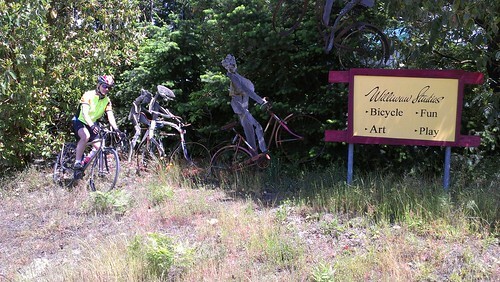 The only downside was that periodically the cement paving was broken by ridged metal grates, which had been covered over in a 2-foot-wide section along the edge for bikes. I’m glad it was dry. In wet weather, I would’ve felt downright nervous about riding across that long expanse of slick metal. But on this day, the views from the bridge were spectacular. We avoided the highway as much as possible, sticking to side roads. 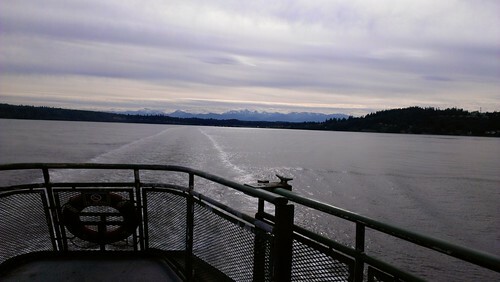 Mostly that worked fine, and we had minimal traffic on the way out to Port Townsend. 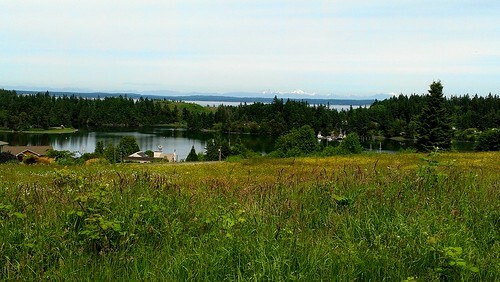 Along the way we went through Port Ludlow, a bizarre planned community that seemed like Suburbia West. No retail or anywhere to work, just extremely large, expensive homes in planned developments for retirees nestled around the bay. It kind of creeped me out, in a way. 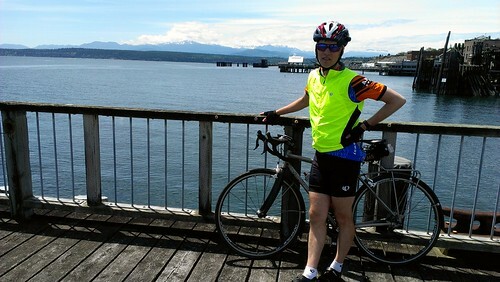 Here’s Dad on the dock in Port Townsend. 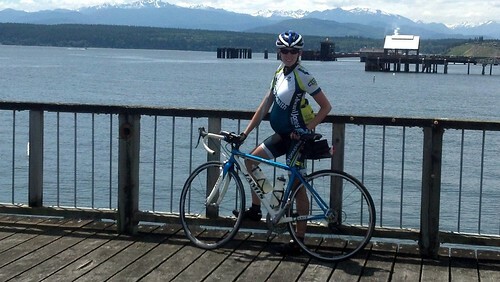 And here’s me (on the other side of the dock). 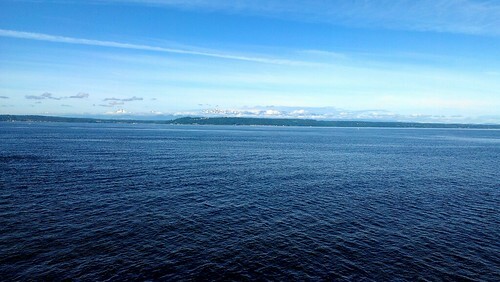 The view from the dock itself was spectacular, and my phone does have the very neat “panorama” feature that let me capture it, at least a bit (zoomed in, the quality is rather poor, but it still gets the point across). 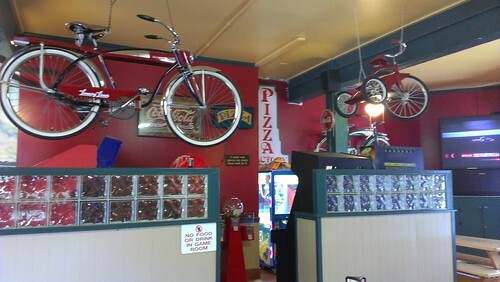 We took our time and split a pretty decent mini-sized pizza at a place that had country music playing, car racing on TV, and bikes hanging from the ceiling. The mini pizza was 8″, four slices, and we agreed that even not on a bike ride, I couldn’t imagine wanting more than half of that anyway. This was an out and back ride, so the good news is we knew where we were going on the way home. The bad news is that we had a spectacularly exciting, and fortunately totally bloodless, encounter with a large (70 to 80 pounds, I’m estimating) dog that liked chasing bicycles. The summary story is that we rode by a house and saw a dog come streaking out at us. It dashed perpendicularly into the road right in front of Dad, who actually hit it with his front wheel. I was behind Dad and off to the side, already slowing down because upon seeing the dog, I immediately predicted it would do that very thing. So Dad hit it, but in a demonstration of excellent bike handling skills, he managed to swerve and stay upright. The dog, when hit, pivoted on its rear legs and streaked back to the safety of its yard, fortunately away from the direction of Dad’s swerve. I was far enough back that I was never in any danger. To add to the excitement, a car going the opposite direction slammed on its brakes so hard that it filled the air with blue burned rubber and that exciting squealing noise. We didn’t even stop to see what happened once Dad regained his balance, but just kept on going. I think Dad wanted to give the dog’s owner a piece of his mind, but it was better to keep moving on. For all we know the owner could’ve been mad at us for hitting his dog. After that, Dad got his heart back into his chest and the ride resumed its more normal, uneventful pace. By the end I think we both felt fairly tired of the short, moderately steep rolling hills that characterize the Olympic Peninsula. 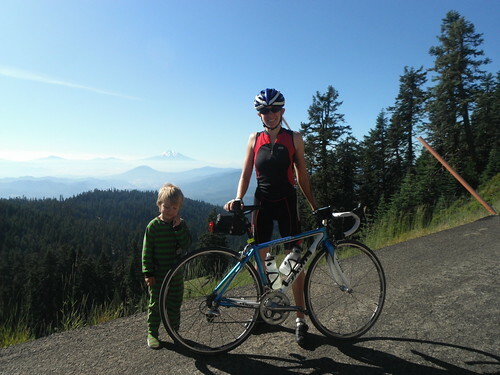 Overall, though, we had fun riding somewhere different, not for speed or intensity, but for simple enjoyment. We arrived in Kingston in time to get ice cream, walk around a bit, and join the queue for the 5:30 ferry home. Here’s the ferry pulling into the dock. By the time we arrived back at our car, some clouds had started moving in, foreshadowing the drizzly weekend to come. However, rain held off and the temperature remained comfortable for eating post-ride ice cream. Goodbye, Kingston. We had fun. 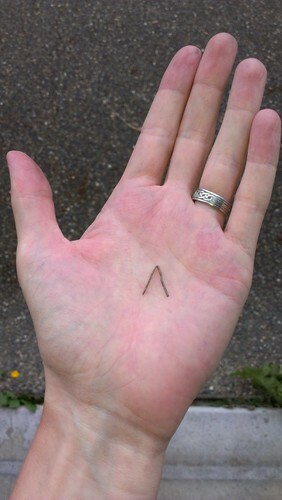 Edit to add: This morning I went out to get my bike ready for a ride up to Snoqualmie Falls and I immediately saw this in my rear tire. When I pulled it out, it turns out half the thing was actually embedded in there. Boy, I’m sure lucky I made it back to the car yesterday. I must’ve run it over just before we finished. 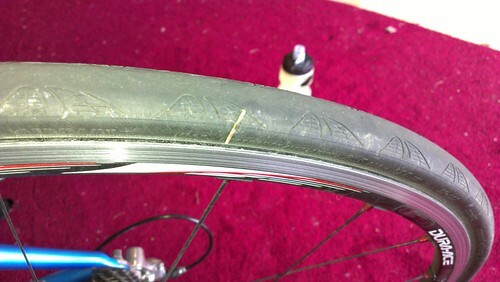 I was starting to feel like my rear tire was a bit squishy, but I figured it was probably just that end-of-ride fatigue. Hah! Of course, now I have to wrestle with the darn tire to change the flat. PS – If you feel the picture of me doesn’t really make me look pregnant, try this one. 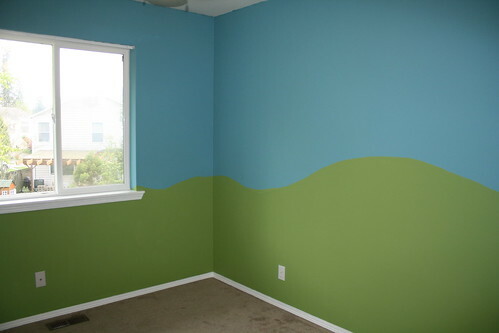 Working from an extremely sophisticated paint schematic (shown below), four lovely helpers converted our spare bedroom from a kind of dismal, Seattle-winter-sky-plus-purple color into the a room cheerful enough that I’m frankly a little jealous. 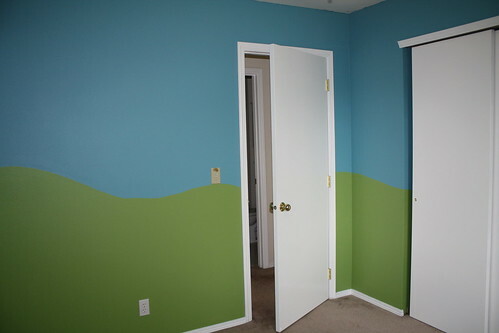 I didn’t take any before pictures, because it was just the extra bedroom. Most notable feature of said bedroom was a set of 4 white corner shelves. They were quarter-circles that fit into the corner next to the window, put in by the previous owners. We decided that they took up too much space, corners being prime bedroom real estate, so boldly moved to remove these shelves. Hours later, we were cursing the former owners, who had used four screws per home-made shelf: Two 2-inch-long wood screws going into each wall near the corner and screwed into wall anchors; and two 3-inch-long wood screws screwed directly into studs on the outside of each shelf. That would’ve been bothersome enough, with all the twisting required to get those out; but, on top of that, they had stripped the outer screws during installation, and then painted over all the screws. This meant that we had to drill around the exterior screws and then use pliers to slowly twist these incredibly long screws out, not to mention dealing with the stupid paint filling up the non-stripped screw heads. I’m telling you, those screws left holes in the wall reminiscent of the size of holes in Jesus’ hands. After taking out those shelves, I’m pretty sure Ian or I would have gladly throttled the previous owner with no qualms whatsoever. Anyhow, we got the shelves out. 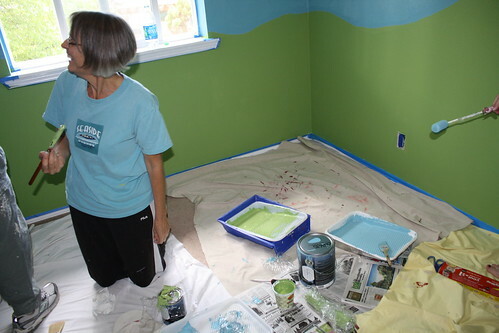 This morning we purchased paint — super-nice Benjamin Moore Aura paint, by the way, which required only one coat, had minimal smell, dried looking gorgeous, and is fully washable; the people doing the painting loved it — and dug out our painting supplies. Mom, Deborah, and my friend Karissa all rolled in around 9:00. Commence the painting! Actually, commence the taping, but whatever. 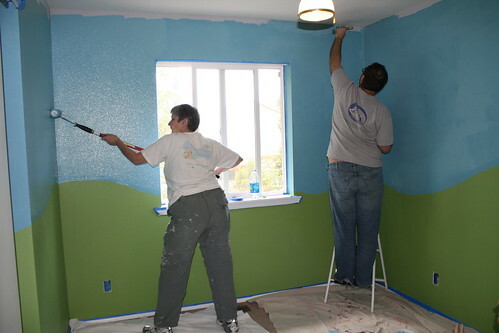 I helped with that part, but left them to the paint fumes when we started opening cans. Which was kind of sad, because they sure did seem to have fun. I made homemade cinnamon rolls for sustenance. That takes a lot of effort and hours of rising, plus produces tons of dishes, so it gave me plenty to do while they painted. Partway through I fed the painters fresh, hot cinnamon rolls and the sugar high gave enough of a boost to finish the room. I spent the rest of the time mostly in my office, the next room over, avoiding the fumes but enjoying the conversation. 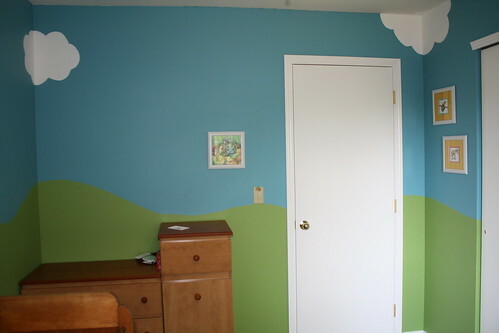 We still plan on putting clouds around the top, but had to let the blue dry. That’ll also be our chance to touch up any places blue got on the ceiling. I’m delighted with how it turned out, and as before mentioned, I’m actually rather jealous at how cheerful and bright the room looks. Now my office looks dowdy and boring. (More painting in the future??) 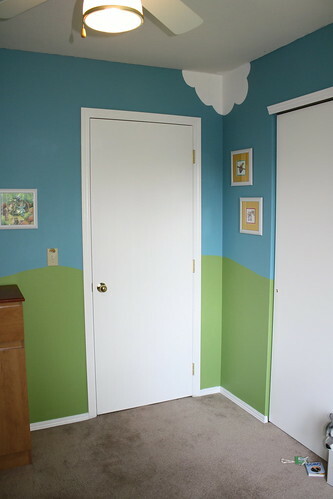 Also, I’m hoping that’s a paint job that will age well enough that The Boy will be happy with it beyond babyhood. 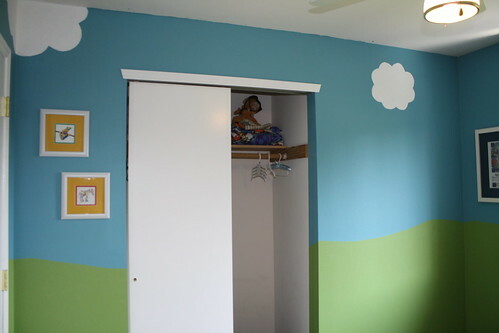 When he’s old enough, he’ll be welcome to repaint if he wants. 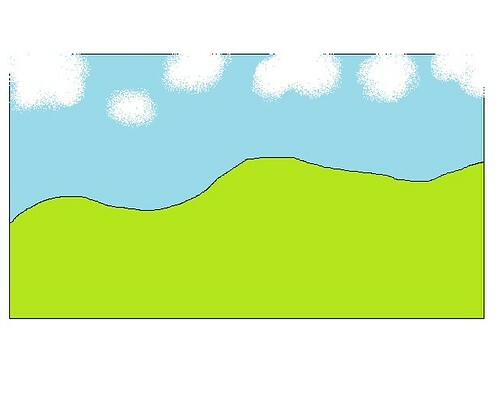 Until then, it’s blue sky and green hills. 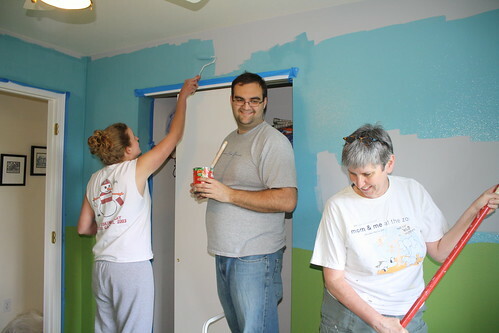 A huge thank-you to Mom, Deborah, Karissa, and Ian, who accomplished a ton of painting in one morning. Thank you! About 15 years ago, a study came out that seemed to link autism and vaccinations. Hearing this, many alarmed parents put on the brakes and decided not to immunize their kids, hoping to protect their darling bundles of joy from autism. As a result, we now have a rather astonishing number of un-immunized teens and young adults running around. Now, even at the time this study came out, it wasn’t a 100% for-sure thing (nothing in science ever is). Parents jumped on this bandwagon eagerly, wanting to protect their kids, but without strong scientific backing for that decision. And then, of course, the apparent correlation was pretty roundly discredited. Other scientists couldn’t replicate the findings, a crucial part of the scientific process. The CDC states firmly: “CDC supports the [Institute of Medicine] conclusion that there is no relationship between vaccines containing thimerosal [the ingredient in vaccines thought to cause autism] and autism rates in children.” Other articles, such as this 2010 one in CNN and this 2011 one in NY Times report the same thing: Far from supporting the original findings, numerous other studies have shown no link between autism and vaccination. On top of that, the original study was shown to have fraudulent results. Most of the co-authors of the original paper retracted their support. The Lancet, which originally published the autism-vaccine study, retracted the original paper when “A British medical panel concluded last week that Dr. Wakefield had been dishonest, violated basic research ethics rules and showed a “callous disregard” for the suffering of children involved in his research.” See also: Here; or Google it yourself; innumerable articles provide all the details. To summarize: Other scientists couldn’t replicate the original results apparently linking autism and immunizations. In fact, many other studies seemed to show the opposite, that there was no link (note: this is important. Having a variety of people in different labs in different places getting the same results suggests there’s something in those findings). On top of this, the guy who ran that original study had such sleazy ethics — taking money from people suing vaccine companies, for example — as to induce a very reputable journal to toss out his findings. Is this the kind of evidence you should trust when deciding what to do for your kid’s health? Why is this important now? Because Washington State is experiencing a whooping cough epidemic, and it could very easily be avoided. We have an effective vaccine against pertussis. Kids are supposed to get it early in life, and adults need occasional booster shots (the TDaP). Historically only immigrants who never got immunized have suffered from this disease. Yet now we’re getting 400 cases of whooping cough recorded every month, with an anticipated 3,000 cases recorded by the end of the year — and, given that only about 10% of cases are reported, that’s really alarming. Whooping cough isn’t a disease to mess around with. Imagine spending three or more months coughing, unable to lay down, because ever time you get near horizontal, you cough more. Sleeping propped in a chair. Coughing uncontrollably until you nearly pass out, and then sucking air in desperately as stars sparkle in your vision. It’s like the worst cold you could imagine, except even worse than that, for months. I happen to have personal experience with this particular disease: My mom got it when we were kids. I’ve seen the entire thing. Fortunately, my parents had vaccinated us, so we didn’t get it. But even though I was young when it happened, I’ll never forget the coughing misery mom went through for what seemed like years. Also fortunately, adults don’t usually die from it. They just suffer some of the most miserable months of their lives. Infants and young children, however, do die from pertussis, usually contracted from an un-immunized adult in their lives. That is why it’s important for adults to get their TDaP booster shots. Protect the young children in your life: Get vaccinated. After looking at the way things are on this earth, here’s what I’ve decided is the best way to live: Take care of yourself, have a good time, and make the most of whatever job you have for as long as God gives you life. And that’s about it. That’s the human lot. Yes, we should make the most of what God gives, both the bounty and the capacity to enjoy it, accepting what’s given and delighting in the work. It’s God’s gift! God deals out joy in the present, the now. I had a brief moment of panic when I realized that the end result of pregnancy is MORE RESPONSIBILITY, not more freedom. It’s strange; I’m still wearing pretty much all the same clothes, and my body image hasn’t changed, but when I look in the mirror, I’m not the me I envision. Who is this 25-week-pregnant matron staring back at me? 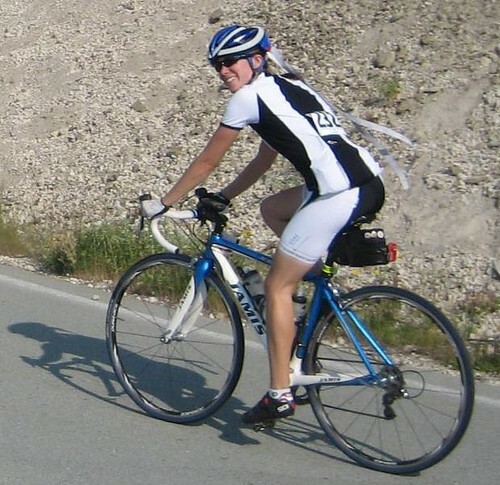 What happened to the sylph who looked good in bike clothes and could kick most of the boys’ butts out on the road? Probably good thing it takes nine months to get to this new reality. The adjustment is coming, but slowly. A friend took me to a baby store in Seattle and my first instinct was to turn around and walk right back out the door. What does this have to do with me? Do I really have to do all this, BPA-free bottles, organic-fiber diapers (or should you do cloth diapers and a diaper service? ), brain-enhancing heirloom wooden baby toys, the right brand of stroller*? And all the mommy-stuff, too, the larger bras and pants and shirts to hide the “pregnancy weight”; the breast pumps, the nursing pads, ugh. Why does having a kid require so much infrastructure, such a big rigmarole, the acquisition of endless stuff? If acceptance of parenting-readiness is measured by amount of anticipatory baby-related detritus purchased, I’m nowhere near there. I am overwhelmed with all the choices and I want to refuse to make them. I still wear clothes from high school. My last new pair of jeans: 2008. I don’t want to have to buy clothes or stuff for myself or for The Boy — I’m stingy, not with the money, but the time and emotional investment. You will not hear me gushing about my super-cute baby bag or posting pictures of darling [insert choice of item] for us. I want simplicity. 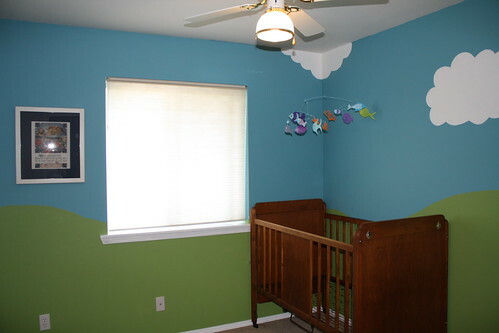 But having a kid, it’s like suddenly you’ve started a major construction project and require dozens of contractors with varying expertise, not to mention all the materiel, engineering plans, and other resources. It’s crazy. Caveat in case you’re concerned: Don’t worry, we’re looking forward to meeting The Boy. Just… maybe with a little less of the stuff. Edit to add: If you’re a parent, I would be interested in hearing about the ONE thing you found most valuable. 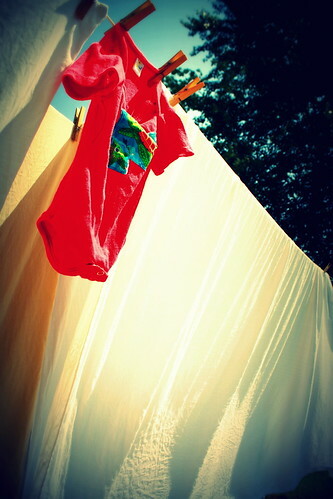 What is the one item you couldn’t have done without when your child was an infant? *Ian’s stroller contribution: From ThinkGeek, of course! The way I assimilate change is to try to understand it. I research it. Having head knowledge helps me feel more in control of situations I’ve never encountered before, even when head knowledge doesn’t guarantee success for those situations. When I was in high school, I took a class called Athletic Injury. It covered, very lightly, types of athletic injuries high school athletes encountered and various ways of identifying and treating them. I found it deeply fascinating. But when it came down to it, I wasn’t very good at it. Wrapping tape to immobilize a thumb or mitigate shin splints eluded my normally straight-A-student skills. To compensate, I read the textbook diligently. I practically memorized the book and spent hours practicing taping a variety of patient victims friends and family. In the end I did just fine in the class, but I worked harder in that class than most of my standard academic classes. Anyway, all this to say that I’ve been reading books about parenting, despite the fact that (a) I probably won’t remember more than 5% of what I read now, and I’ll implement even less; and (b) Parenting seems to involve as much instinctual behavior as deliberate choices and odds are I’ll be operating on autopilot most of the time anyway. Reading, thinking, and talking about how we’re going to deal with the boy when he gets here is my way of starting to accept the reality that he is coming. One thing that all this reading has done is help us start figuring out priorities. Mostly we anticipate being pretty laid-back parents, with less in the way of highly scheduled calendars and more in the way of back yard mud time. But one thing I’m realizing: Sleep is really important to me, even more than to Ian. I don’t caffeinate to get by when I’m tired; I go to bed earlier. Even before I got pregnant, I regularly slept 8 to 9 hours a night, sometimes more. I almost never sacrifice sleep to play. I’ve learned that without adequate sleep, I turn into a horrifying combination between a brain-dead basketcase and a ravening monster — a zombie, perhaps, except instead of braaaaaaains I demand only rest. One standard expectation I keep hearing: I’ll spend the first six to 12 months of the boy’s life stumbling around sleep-deprived and zombiefied. I dread this potential reality more deeply than anything else about having a child. However, a number of the books I’ve read suggest that endless broken nights aren’t mandatory for parents of infants, but instead are avoidable with certain deliberate decisions made early on in the child’s life. So if we don’t implement any other advice, I plan on following the baby sleep training advice with the diligence and tenacity of a marathon runner preparing for the Boston Marathon. Also, research indicates that adequate sleep is integral to child development, particularly early on. Thus, no compromises: I’m going to be a sleep Nazi. Other things may slide, but sleep won’t. I feel sorry for kids born into families so obsessed with getting ahead that they have to start achieving before birth. People only get to have a few carefree years as kids, and it does them a disservice to force them early into the kind of miserable, achievement-oriented, over-scheduled, distraction-laden, stressful life most adults endure these days. * The title refers to this. Props if you knew that already.